My family lives in a small house (a cottage really) with a small back yard, and although it’s a tad squashy from time to time, I look back and think of all the benefits: less cleaning, less cost for utilities, lower mortgage. Compared with all the McMansions that surround & dominate our little house, I wonder how those owners cope with all of those demands. It was perfect when our kids where quite small, however now that our eldest is approaching her teens, we’ve decided that some things need to transform to suit a new stage in our lives as a family. 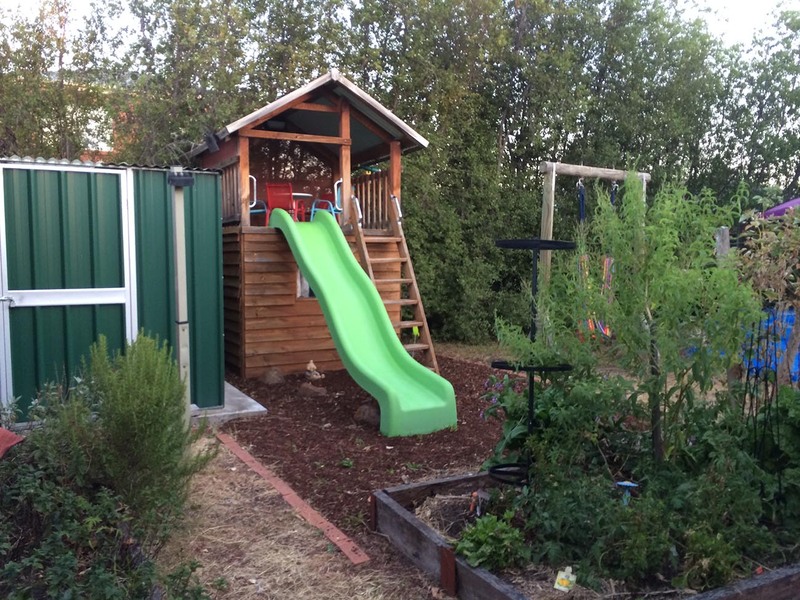 Over the past 6 months, the cubby house has given way to a swimming pool, and our kids are making grand plans “pool parties” in the coming months. The challenge we faced was deciding to make a commitment to stay in this house for the long term. We looked at other houses nearby and realized that if we moved to a larger existing house, many of those built now have tiny back yards, too small for a pool. We did have to make some sacrifices: the existing cubby had to go (but the kids are getting a bit old for that), the small pocket of grass had to go (but that never got watered in summer & turns into a dust bowl anyway), and my poor vege & herb garden that you can see in the foreground. I’m still hoping I can find a spot to re-plant for raspberries, herbs etc. The shed has to stay. Part of the bigger picture is to convert our garage into a studio so we need all the storage space we can get. The plan became a puzzle to optimize all the spare space we can squeeze out of it for practicality, but not at the expense of creating a beautiful space to enjoy. Some of the other challenges we faced where surrounding fences of different heights & styles of construction and finish(and non-complying with current pool regs), trees that needed to be removed, but still trying to maintain a level of privacy, old textured concrete paving (bad mistake & we didn’t like it when it was installed). The metal fence I hate: any plants we grow against it die in summer due to reflected heat. 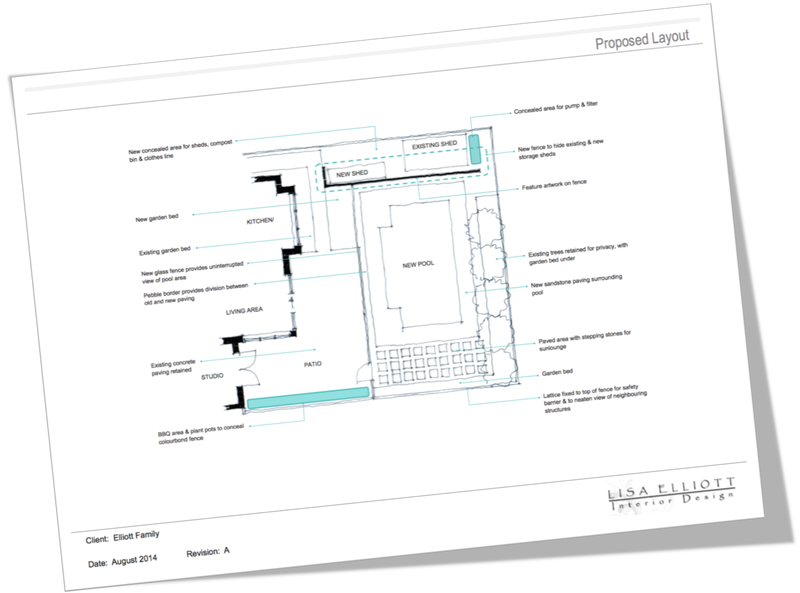 After deliberating over whether we needed to move the shed to a better location, what size the pool would be (swim spa or standard pool), the final proposed layout was to keep shed where it is, hide the pump & equip in the corner behind it. 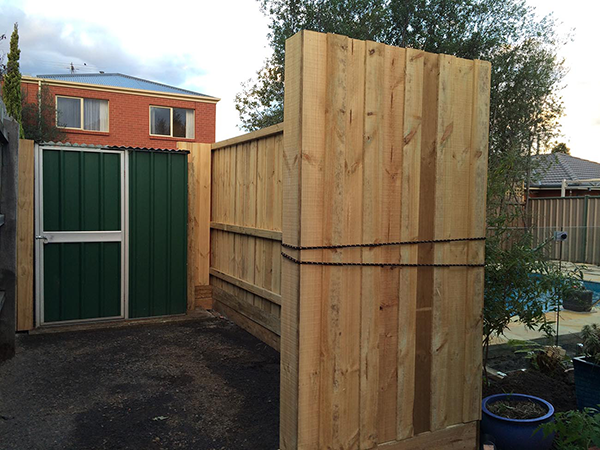 Building a new compliant fence in front of the shed, gave us space to hide a new smaller shed, compost bin & clothes line all out of sight. 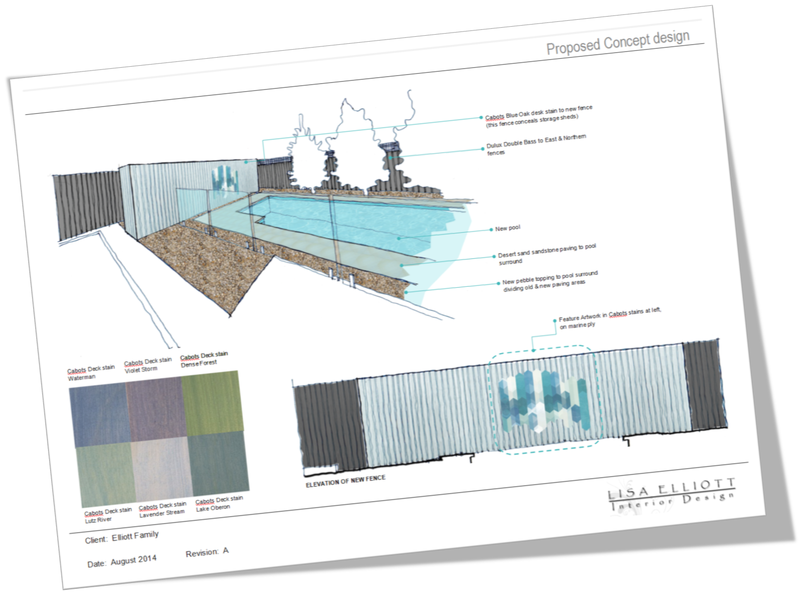 Thus creating the opportunity for a beautiful framework for the pool to sit in. 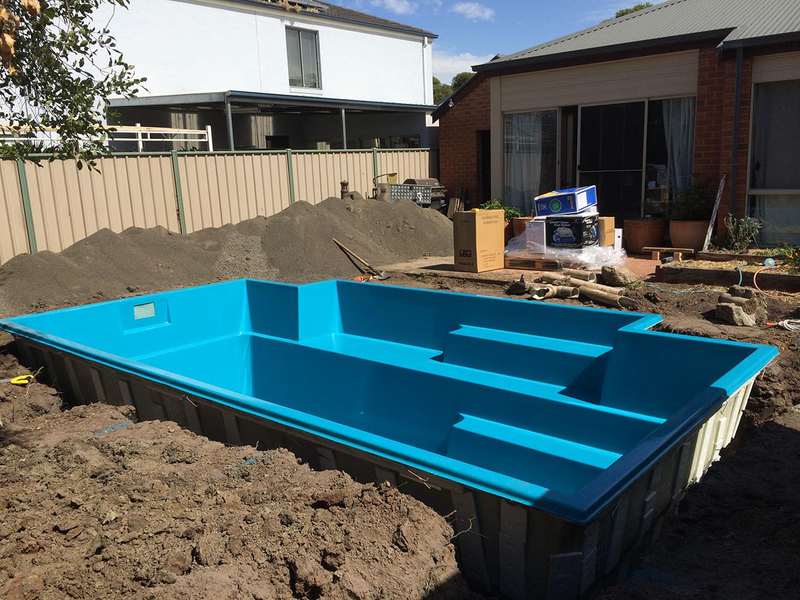 We selected a fibreglass 3.5m x 6m Elegance pool from Leisure Pools (http://www.leisurepools.com.au/en/showroom/swimming-pool/elegance), that fit perfectly into the space, whilst still providing areas to sit & relax. It’s just big enough for us and a few guests, and for our kids to practice swimming. Combined with a solar heating system, we’ll get great use out of it for up to 5 months of the year. It has an automatic system to maintain chemicals & a robot to clean it. 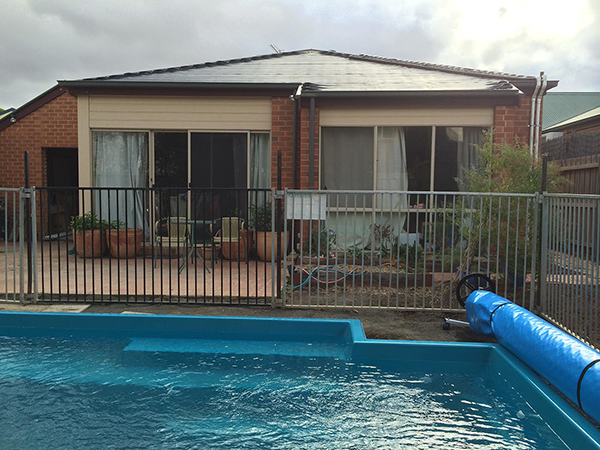 It is a small pool, needing less water to fill & connected to our existing solar cells and utilising a pool blanket, we feel that it’s a great set up for us. The next stage will be the fun bit. Deciding on colours for the surrounding areas, plant types, etc. 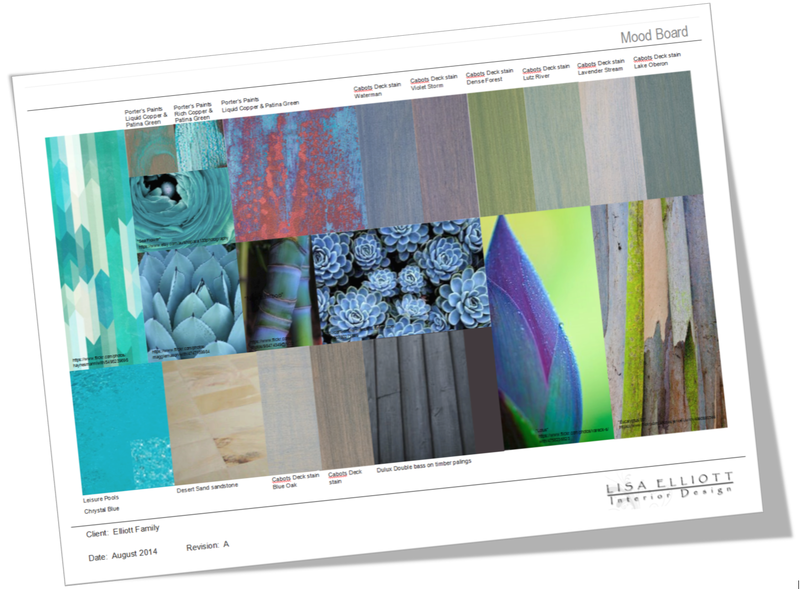 I’ve put together a mood board; it helps me keep in track with ideas rather than moving off on a tangent. The next stage was to work out what finishes to apply where. 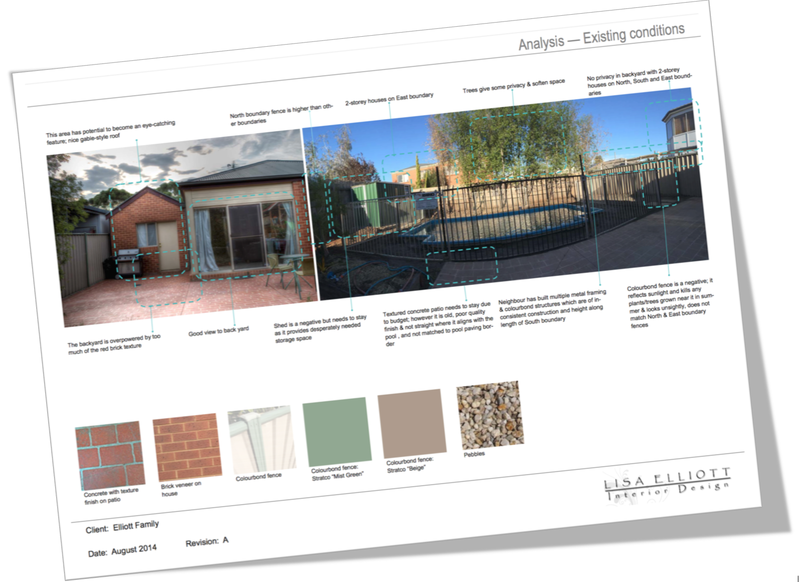 We decided to install Desert sand sandstone surrounding the pool, as the stone has similar hues of brick red which would work well with the existing textured paving & the brick veneer of the house. The creamier/sandy colour of the stone also works well with the timber details on the house & the hated metal fence. Our garden is small, so we needed to keep many of the main finishes consistent for simplicity. 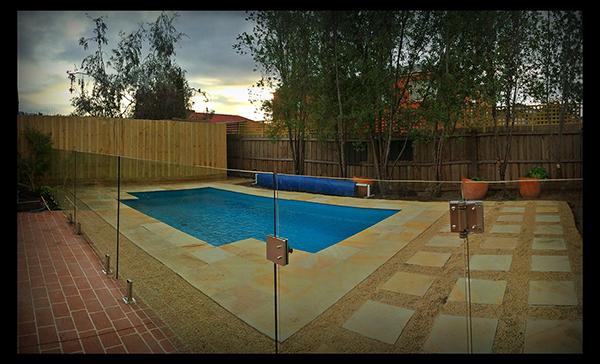 The glass fence that divides the house from the pool is frameless & was the best solution for our small back yard. Small pebbles in cream/red brick tones divide the old & new paving areas, provide natural drainage & perveous surfaces. Stepping stones at the south side will be planted with mondo grass to soften the area. Here’s the perspective at a larger scale. 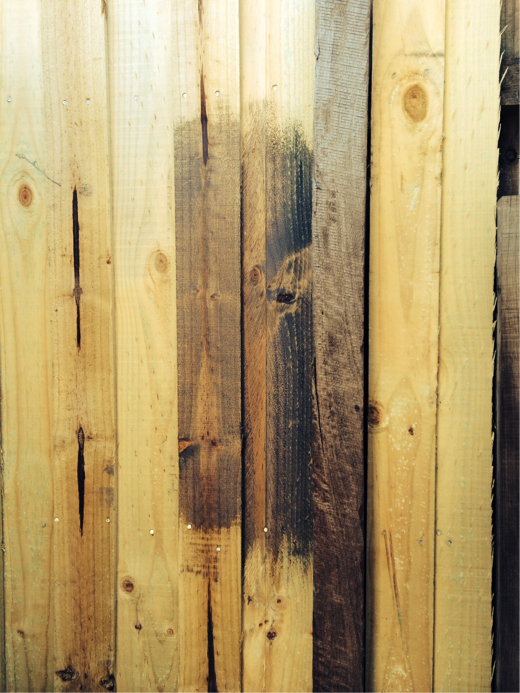 I’m going to stain the new “feature” fence that hides the sheds in Cabot’s Deck & Exterior Stain “Blue Oak”. I bought a sample pot the other day & painted a trial area. The artwork in the centre of the fence will be removable (in case we get sick of it & want a change). I’ll look at that in more detail in a month or so………..We’ll plant out the area at the front with a native tree fern, succulents, & maybe a large shallow bowl planter for herbs. The boundary fences will be painted in Dulux “Double Bass” so they will visually recede into the background; with the existing trees in front & an under planting of lavender and other greenery, it will give more of an impression of space & depth in our small garden. 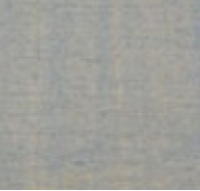 We also tried Dulux “Klavier” on the fence, but the “Double Bass” faded into the background more readily. We started clearing the back yard in January, and the pool installation commenced in March, with lots of dirt and dust. 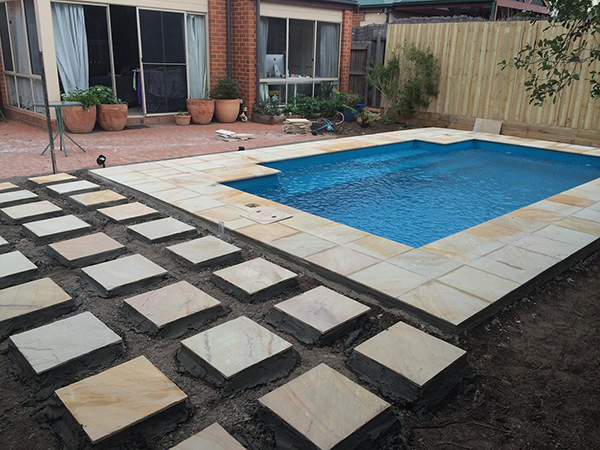 Leisure Pools Western Melbourne arranged of all the permits, project management, installation & solar heating, putting us in touch with a landscaper & fencer to make the process easier. 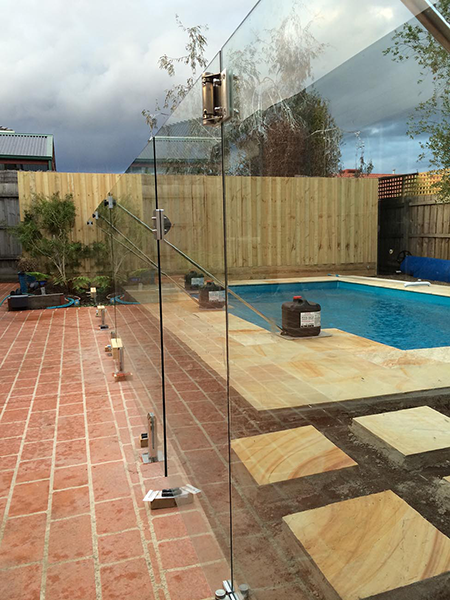 Sunline Glass Technology installed the glass fencing. Nu Vision Landscapes installed the new fence to hide the sheds & the paving and stepping stones. Looks good enough to swim in now (pity the water temp is 13 deg). We easily worked through the details of tile setout on site & they were very accommodating with experimenting with the stepping stone setout and locations. We decided to install all the garden soil & pebbles ourselves, which was hard work as they all needed to be carted in by hand in buckets through the glass gate (we couldn’t use a wheelbarrow on the stepping stones). 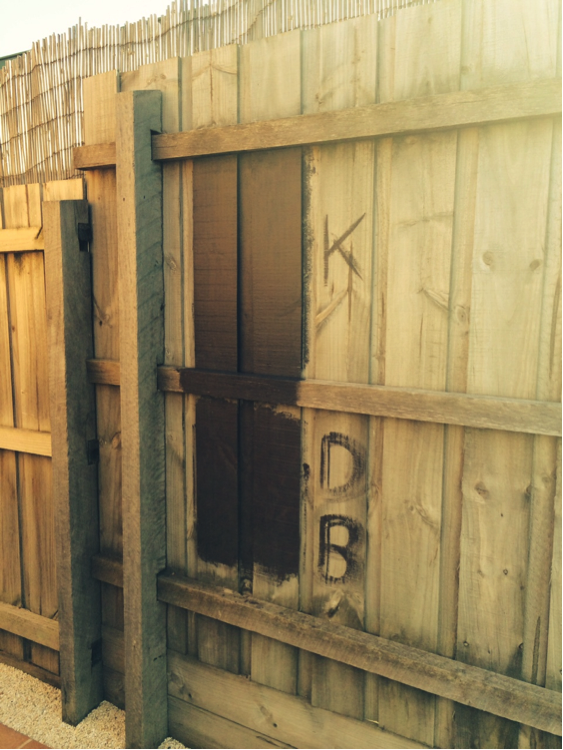 This is the result so far, but still lots of work to go with planting & painting fences, furniture, waiting for summer………….